I have an affinity for black. I usually have to show self-restraint in order to not stock my sewing studio with black fabric. So when I came across this gorgeous navy blue, I awarded myself a reprieve. I mean, it's dark but it's not black so that makes it okay! This Mood Fabrics fabulous find, a dark navy woven is from designer Theory. And just as stunning as this fabric is, it's equally unusual. It's a woven with 2-way stretch that feels and sews like a neoprene. It's magical when used on a structured garment as my skirt and also has an incredible drape. My top is Simplicity 1283. With the mass appeal of this particular pattern line, I was surprised by the lack of pattern reviews when I googled it. I was practically on my own with what to expect. It's a crop top for sure and being that I'm pretty tall with a lot of torso, I added 3 inches to the length. Had I not, I would have had practically a sports bra on my hands because it's that short. Please be aware of that. And this top also has an inch of negative ease. I needed a size 12, but due to the figure hugging design of this top, I went up to the size 14. (Some may need to do a FBA.) But the fit still worked well with my fabric choice. And surprisingly, the sleeves are drafted with a generous amount of length. I didn't have to add any additional length to them. I wanted my version of a crop top to hit at the natural waist and meet at the top of the skirt. 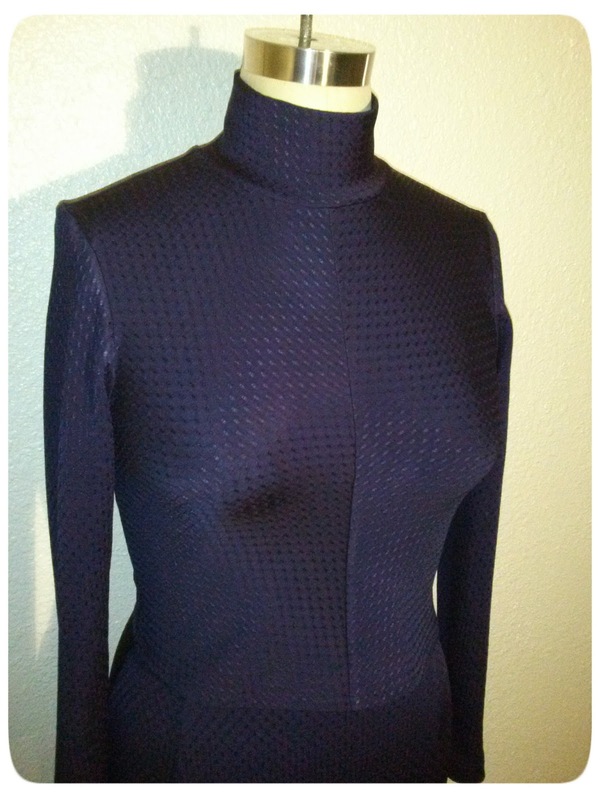 It's a really cute design, easy to make, quick to sew with the mock turtle neck style and an invisible zipper closure. It could easily be turned into a longer top or a dress. It's worth having in your collection as a base pattern even if you're not into crop tops. The pattern design, which is designed for a knit worked well my stretch woven. 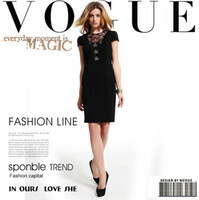 My skirt is Vogue 1296. This fabric was the perfect match for this skirt. I love how it works so well for a structuced garment, yet has such an amazing drape all at once. I cut the size 14 for my skirt and added 3" inches to the length. I omitted the lining. The fabric is beefy and opague enough to where it holds its own. After wearing this outfit which included entering and exiting my vehicle; standing and sitting, it has wonderful recovery. There was no stretch out or sagging. 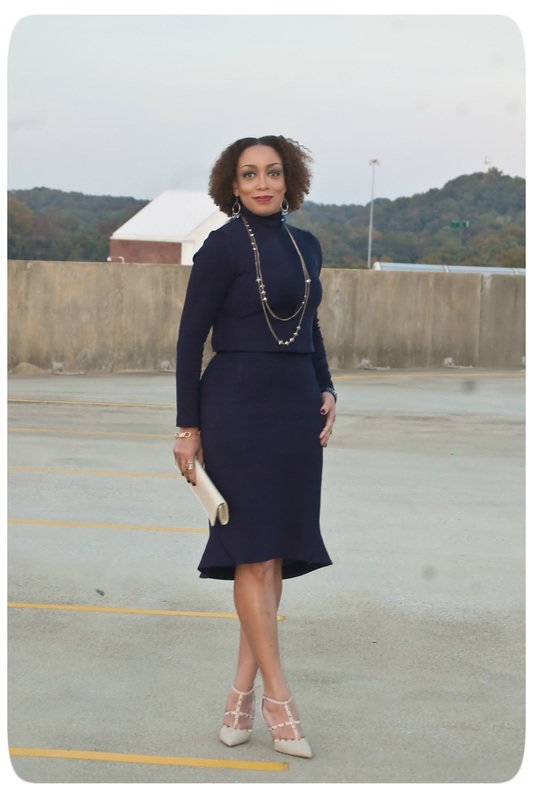 I love this outfit and navy is such a "glowier" and more flattering color than black. There's a softness and a richness to a great navy. Lovely work as always. I love Theory, I'm going to have to go look for their fabrics. Beautiful outfit! I've always been a fan of Theory too. When I bought RTW, I use to buy their pants all of the time. The make the greatest pants! Thanks Heather! I love, love, love this! Isn't navy a wonderful alternative? Navy looks so sophisticated! Thanks Donne'! This is a beautiful combo. You wear it well. Oh! I love this! 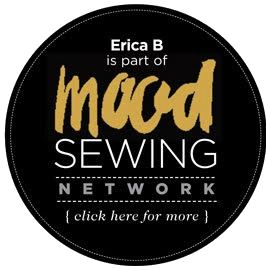 Looks awesome on you, Erica! SHARP as usual ! And I love where the top hits the skirt. Gorgeous outfit. 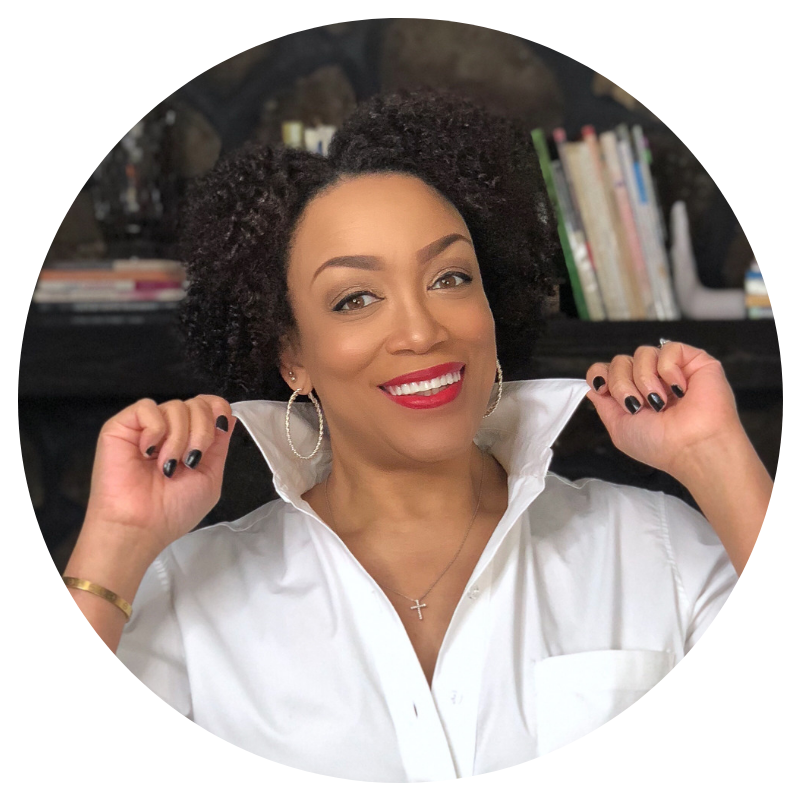 Thank you for showing how an age "late 50's" woman might manage a crop top and w/o the turtleneck.Can't wait to try the fabric. Gorgeous! Glad to see your feedback on the 1283 top. I have it but will definitely lengthen. 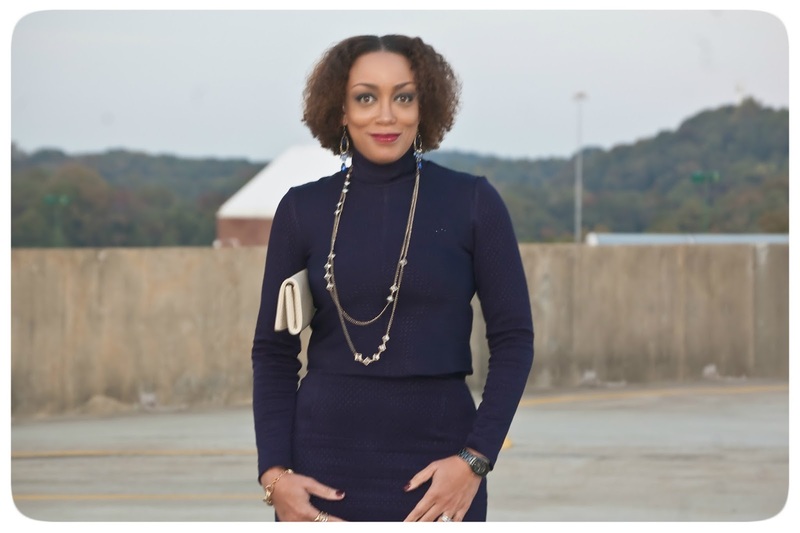 This is a great alternative to a full turtleneck or funnel neck (which doesn't fit my neck area well). So sleek and elegant! I am inspired. Another great outfit! 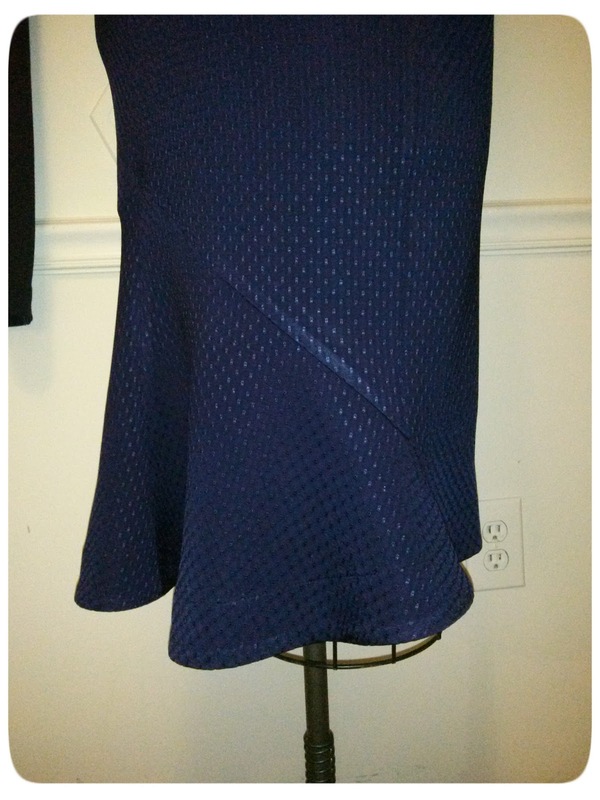 I really like the detailing on the skirt...and navy is one of my favorite colors because it has such a broad spectrum from light to dark! It's a new favorite of mine too now! I love how rich it looks! Thanks Carolyn!